Wansdyke continues eastwards in a reduced form that greatly resembles its West Wansdyke counterpart. No doubt this is caused by the terrain, the soil and the largely afforested cultivated land. Wansdyke keeps to the south of several dry valleys, though it can be asked why it did not continue along the main ridge of the Downs, which would have guaranteed a wide view in almost all directions, certainly if the hillfort of Martinsell had been used. The field of view in its present state is very difficult to ascertain, but at several places it must have been blocked. One can but wonder, but maybe it had to do with the distance to the river Kenneth, which no doubt formed the real border. East Wansdyke south of Heath Plantation, in a 1926 drawing (click here to enlarge). 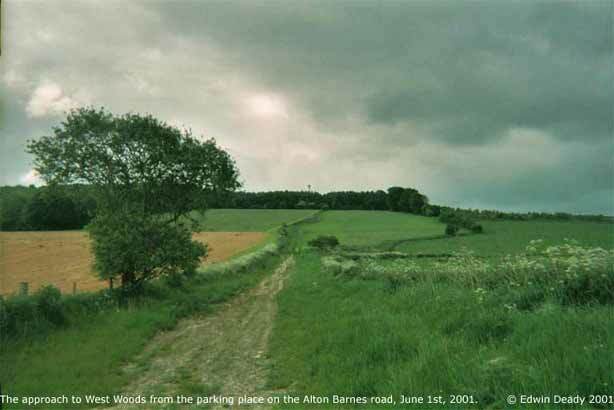 After passing the former village of Shaw, Wansdyke disappears from view over short stretches when it nears West Woods. Here it was mentioned in the Anglo-Saxon charter of AD 939 as Titferths Gate (Thonne on Hyrs Leage up to Wodnes Dic on Titferthes Geat). Wansdyke sticks to the hill crest, which apparently made right angle turns necessary. Another explanation would have been the existence of a land division or clearing which had to be used. Either way, with disadvantageous alignments both on West Wansdyke, Morgans Hill and Bishops Cannings Down in mind it remains hard to see why the builders of Wansdyke did have to choose for such a radical option at this point. But maybe someone had done his homework very badly, and as a result two teams of workers nearly missed one another! (click here to enlarge the image to the right). 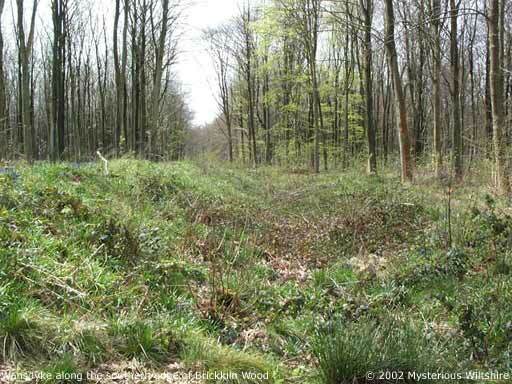 Through the dense forest of West Woods, which may have been a continuation of Savernake Forest, the thick forest cover was probably somewhat less during the time of construction. If not, one cannot fail to wonder why Wansdyke was ever built here. Standing in a wide break on Wansdyke looking northeast, one may wonder how they pulled it off. It is hard at times to keep track of the earthwork throughthe dense foloiage, and the Wansdyke Path not always follows the earhwork. Nevertheless, the experience within the woods is sometimes quite mysterious. 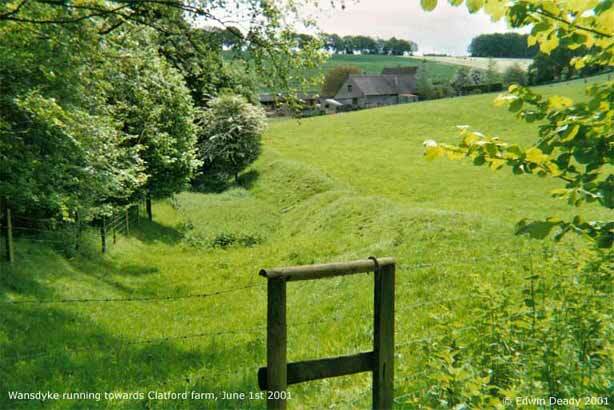 When nearing Clatford Farm, Wansdyke retains some of its glory, breaking from the dense forest. Wansdyke looking west to Clatford Bottom. The place where today the main Marlborough - Pewsey road (A 345) passes through, looking north. Whatever the real terrain in those days, here we encounter the first ever mentioning of Wansdyke by name, in the North Newnton charter of AD 892: And swa to Wodnes Dic, thonne forth be thaere dic on Crypel Gaet. 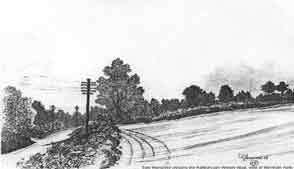 This was probably the place where today the main Marlborough - Pewsey road (A 345) passes through. 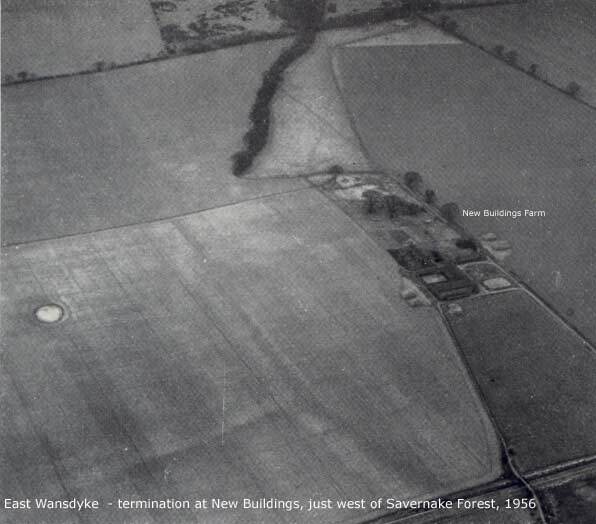 East of the road, Wansdyke is ploughed out, but it reappears shortly and continues on a diminished scale across Wernham Farm to New Buildings, where Wansdyke simply peters out in a field just short of the edge of Savernake Forest. Why does Wansdyke end here? I will discuss theories that it did not elsewhere, but at this moment all the evidence points to at least a major discontinuation at this point. There are several reasons for supposing it never went further. 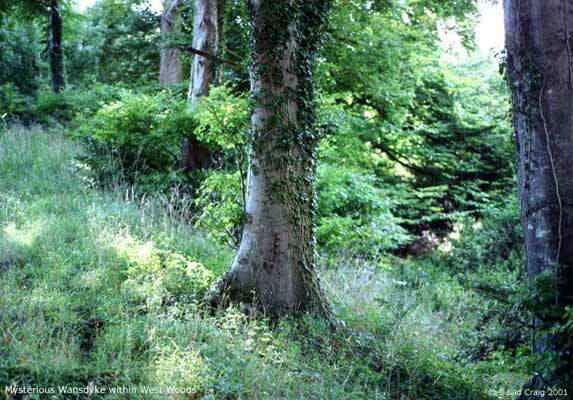 First, the woodland may always have been there, a reason for not continuing as we have seen earlier. However, no less than two Roman Roads traveled within a few miles of here, roads that the builders of Wansdyke surely would have liked to control. However, as Fox & Fox have proposed, these roads my have been out of use during the time of construction and therefore useless, the main traffic already reverting back to more ancient roads such as the Ridgeway. Crawford has warned rightly that a Roman Road may have gone out of use even during the heyday of the Empire, simply because it was built for other (strategic) reasons and day-to-day use favoured other routes. But then Fox & Fox opt for a construction date much later than I do. (click here to enlarge the air photo). Another reason may have been the terrain, which caused travelers to seek diversions due to flooding, which may have happened on the Marlborough-Salisbury Roman Road. This one went surely out of use at an earlier date, a reason why we are still at a loss as to its exact course here. Maybe Wansdyke indeed blocked a diversionary route (through Crypel Gate?). 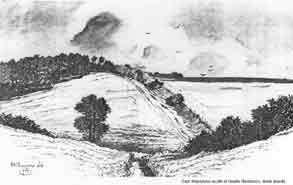 A reason that has my support, but is not mentioned by other researchers, is that Wansdyke was restricted to the area where its originator came from. 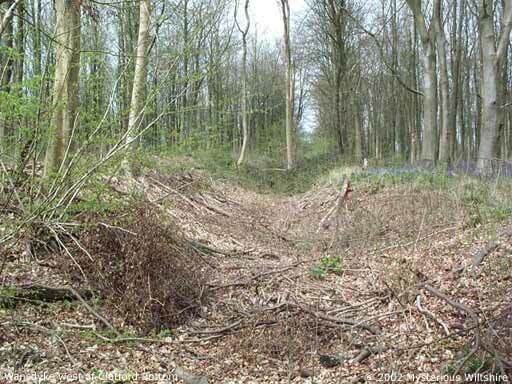 When Wansdyke was indeed built shortly after the Roman era in a Briton vs. Briton conflict situation (as I propose), the cantonal organization of Britain would still have been in use. The Roman cantons (civitates) were based on pre-Roman tribal areas based on cities. My guess is that Wansdyke was initiated from the Durotrigan civitas based on Dorchester, and defended that area against the Dobunnic civitas based on Cirencester to the north. However, although the exact inter-cantonal borders are not exactly known, although it is supposed that the Roman small town of Cunetio/Mildenhall (just east of Marlborough) was situated in the next civitas, that of the Atrebates, based on Silchester. Therefore, it seems to me a very good reason to propose that Wansdyke simply ended here because the northern frontier of the defended area ended here as well. This may be supported by two little known linear earthworks to the northeast and southwest (Bican Dic and the Bedwyn Dyke), which are both connected with the ramparts of a hillfort (Liddington Castle and Chisbury) and which both face west. Directions to Section 10 can be found here. Several images by kind permision of David Craig and Edwin Deady.